Released to coincide with International Women’s Day 2017 this album celebrates three female pianist-composers whose work really should to be more widely known. It also marks a milestone for Hyperion’s long-running Romantic Piano Concerto series, which has now reached Volume 70. Add to the mix the talents of pianist Danny Driver – whom I last encountered in a splendid collection of pieces by Benjamin Dale and York Bowen – and the auguries for this new album seem very good indeed. The US-born conductor Rebecca Miller’s discography may be small, but it’s eclectic. At the more conventional end of the spectrum – but with a period twist – are two recordings of symphonies by C.P.E Bach and Haydn, both of which were well received on these pages. Then there’s some 20th-century Americana – the orchestral works of Henry Hadley – which Rob Barnett made one of his Recordings of the Year in 2014. And closer to the 21st we have a disc of music by Aaron Jay Kernis, one of Byzantion’s top picks for 2011. First up is the Briton Dorothy Howell, who spent much of her career teaching at the Royal Academy of Music. Her compositions were championed by Sir Henry Wood, who premiered her symphonic poem Lamia at the Proms in 1919. Among other works he promoted was her Piano Concerto, which he performed in 1923 and 1927. Howell was at the keyboard on both occasions. The work received its first commercial recording in 2010, with the Orion Symphony Orchestra conducted by Toby Purser. Valentina Seferinova was the soloist. Bob Briggs reviewed the Cadogan Hall concert from which the recording was made. The piece did not live up to the promise of Lamia, so it’s no surprise that Howell abandoned large-scale orchestral works after that. In one movement and three sections – marked Moderato marcato, Andante con moto e tranquillo and Allegro moderato – the concerto is in a robustly Romantic idiom, with bold orchestrations and a glittering solo part. With unfamiliar or obscure works one is tempted to seek comparisons, if only to slot the music into some kind of context. It strikes me as somewhat Russianate – lashings of Tchaikovsky and Rachmaninov – with suggestions of Addinsell, too. The trouble with such broad-brush descriptions is that they tend to mask the detail, in this case telling orchestral touches and, for the soloist, pleasing turns of phrase; these paint Howell as a genuine talent, albeit a variable one. I’ve not heard the Cadogan Hall recording, but I’d be very surprised if it has the warmth and generosity of spirit that pervades this one. Driver is flamboyant when he needs to be – what a terrific cadenza – but he also knows when to scale back; that helps to sustain a fresh and interesting narrative, particularly when the material gets a little thin. Miller and her band are rather more boisterous, egged on as they are by a very immediate recording. Not a masterpiece then, but worth a listen nonetheless. The other single-movement work here is the Concertstück by the French composer and pianist Cécile Chaminade, who was also the soloist at the premiere. Perhaps best known for her intimate piano pieces and songs she was feted on her travels to England and the United States. The Concertstück (1888) and Flute Concertino (1902) are the only works she composed for soloist and orchestra. That said, she did write another large-scale piece, Les Amazones, for soloists, choir and orchestra, which was premiered with the Concertstück in Antwerp on 18 April 1888. Now that sounds intriguing, but if the paucity of Chaminade recordings is anything to go by I’ll wait a long time to hear it. In any event, this is my first acquaintance with the Concertstück, whose opening string tremolandi and bass-drum thuds really took me by surprise. The rippling piano part, set against emphatic ripostes from the orchestra, makes for an interesting dialogue that rarely stutters or threatens to outstay its welcome. To my ears at least Chaminade’s writing for the piano – with a firm nod towards Weber by way of Brahms and Schumann – is far more assured than Howell’s. Driver certainly makes the most of it; what a magnetic musician he is, and how willingly Miller’s percussionists rise to the big moments. The recording is clean and spacious, with plenty of punch when required. Great fun. The American Amy Beach first swam into my ken in 2009, when I reviewed Vol. 2 of Kirsten Johnson’s authoritative survey of her music for solo piano. That album was included in my pick of the year’s best recordings; Vol. 3 came close to repeating that accolade in 2011, qualifying as a distinguished runner-up instead. Dr Johnson really is a singular pianist, and I do wish she’d record more. Indeed, the Beach concerto is waiting for her when she does. Any takers out there? Beach is by far the best-known of the three figures represented here, and that’s reflected in a sizeable discography. Included are at least two recordings of the Piano Concerto, among them a version by the Nashville Symphony Orchestra under Kenneth Schermerhorn, a doughty champion of American music (Charles Ives in particular). The soloist on that album, which includes Beach’s ‘Gaelic’ Symphony, is Alan Feinberg. He, too, is a strong advocate of American music. That Naxos CD, reviewed on these pages in 2003, is my comparative here. Keen to return to the concert platform, Beach premiered her Piano Concerto with the Boston Symphony on 7 April 1900. It’s cast in four movements, the first of which is a substantial Allegro moderato; at times it reminds me of Brahms’s D minor concerto (1854-1858), both in terms of its general idiom and the unashamed lyricism of its piano part. The Scherzo is a delightful perpetuum mobile, which Driver despatches with his customary aplomb. True, Beach’s orchestration isn’t always memorable, but there’s no denying the ease and elegance of her writing for the piano. As with her solo-piano pieces Beach has the good sense not to overwork her material. The Largo, for instance, strikes a good balance between form and feeling, the restless, finale building to a thrilling and proportionate close. And while the Naxos recording is adequate, it’s rather bright and a little scrawny compared with the warmer, fuller Hyperion one. Feinberg’s highly animated playing matches that of the Nashville orchestra, in whose company Miller and Driver seem rather measured – muted, even. The latter recording is a tad subdued as well, especially when heard after the vivacious Chaminade. That said, the extra weight and gravitas of this newcomer points up the Brahmsian influence even more. Listening to the Naxos disc, with its jangling piano, one might be tempted to dismiss the performance as pleasing but rather lightweight. It’s not that simple, though. Feinberg’s playing has much to commend it – the perpetuum mobile is dazzlingly done and the growing excitement of the finale is well judged – and the sheer frisson of his account will appeal to those who find Driver a little too serious for his own good. Neither performance is ideal, but they do offer credible and contrasting views of this lovely piece. Nigel Simeone’s splendid Hyperion liner-notes complete a quality package. 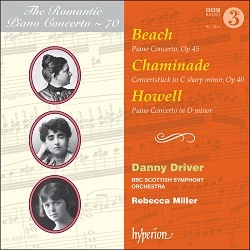 An attractive outing for these concertos, which are well played and recorded; not without competition in the Beach, though.